The setting is the town of Chanderi . Every year during the festive season it is reputed to be visited by a female spirit known as stree . She entices any lone young man by her enchanting voice from behind and takes him away when he turns round , leaving only his clothes behind . This terrifies the townsfolk so much that they write 'o stree kal aana' ( o woman come tomorrow ) on their houses , something that is supposed to ward off the female ghost for the night . If anyone does not write this on his house , he is picked off by the ghost . But Vicky ( Rajkummar Rao ) does not believe this legend and deliberately pisses on the words written outside a party of his friends , thus making it a target of attack by stree who takes away one of the men who are partying . This finally convinces him and his two friends about the truth of the legend . About this same period , Vicky is visited by a beautiful female ( Shraddha Kapoor ) who mesmerizes him with her stunning looks . She makes friends with him and they hang out in evenings . But she says she comes only in the festive season and she never comes inside the temple , even though the temple is the focus of festivities in the festive season . She asks him for material which is fit only for black magic , but Vicky is under the spell of her beauty and readily agrees . Not so about Vicky's two friends . They are soon convinced after a series of happenings that this mysterious girl with mesmerizing beauty who comes only during the same festive season when stree visits but never enters the temple of God ( evil spirits don't dare to go in front of God ) is no one but stree herself . But then the mysterious girl ( she never tells her name in the movie , adding to the mystery ) meets them and their suspicions subside . 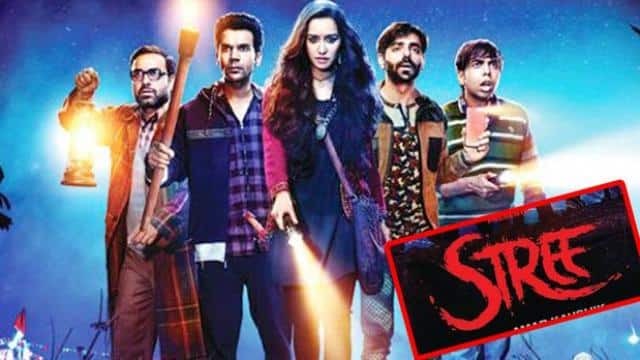 The four visit a person ( Pankaj Tripathi ) who claims to have researched about stree and find a book with him which gives some idea about stree . They learn about who stree was and why she is doing what she is doing . They search out the author of the book ( Vijay Raaz ) who tells about the person who can counter stree . As the plan to counter stree unfolds , the mysterious girl helps them along all the way . And when stree is finally in their grasp , she asks stree to be killed . But when it is time to say goodbye , then she does something that rekindles suspicions that she is stree herself . But one thing is clear . By the time the whole saga is over the townsfolk have come to respect women , something that they didn't do in the past . So what really is the character played by Shraddha Kapoor ? Is she a person who hunts spirits or is she stree herself ? What was her aim in coming to this town to help Vicky and his friends ? Why has she selected Vicky for her task ? Watch the movie for the answers . Both the characters of Vicky's friends ( played by Aparshakti Khurrana and Abhishek Banerjee ) are funny and keep you in splits during the proceedings . Rajkummar Rao acts his usual bumbling mumbling self . Pankaj Tripathi remains a master of playing a small townsman . Shraddha Kapoor looks divine . Background music is good and creates real fear when stree is about to appear . Photography and colours are okay . Nora Fatehi is slim and curvy in her item song . The ingredients are good but you don't get the impression of having seen a great movie . But it is definitely a decent watch . Last edited by ashdoc; 02-09-2018 at 03:50 PM.